The owner of the 34.12 metre (112’) Ferretti motor yacht Robusto has authorized a €10,000 cut in her weekly charter rate for 2016. Robusto can accommodate up to 50 guests for cocktails in port and her professional crew are well versed in the art of keeping large parties of guests happy. She has a versatile cabin layout suitable for two families or a group of adults, accommodating up to 12 guests in five cabins consisting of three doubles, one of which converts to a twin, and two single cabins. Each single also has two Pullman berths so each can sleep three guests comfortably. All cabins benefit from large windows and all have full en suite bathroom facilities. The public areas are gracious and expansive, with a comfortable main saloon offering a bar and full entertainment system, a formal dining area and a shaded aft deck with all the amenities for relaxed al fresco entertaining and dining. The saloon is bright and airy with light wooden floors and neutral coloured soft furnishings while large windows flood the area with natural light. Amenities include high tech entertainment systems like satellite television, iPod docking stations plus CD and stereo players. A large flybridge comes with ample seating, sun pads and a Jacuzzi, creating another excellent space for lovers of the outdoor life while the swim platform, created when the garage door is open, is a great area for everyone on board to enjoy life by the sea. A large variety of water toys include a tender, jet ski, snorkeling gear, scuba diving equipment, fishing tackle and a range of towables including water skis. 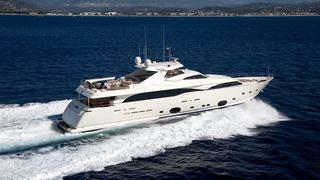 Robusto is available for charter at €80,000 per week, down from €90,000 per week, through Ocean Independence.